Well, it seems to me that Korean fever is getting worse. Starting from Girl Band, Boy Band, Korean cuisine, cosmetics, reality shows, to tourist attractions in South Korea. Even now, Kimchi Country is being heavily promoting the diversity of tourist attractions in South Korea. This promotion is done in an interesting way, for example through various Korean websites, Korean dramas, mini-dramas on Youtube, brand ambassadors, and many others, so that more and more tourists are interested to visit Korea. Talk to beautiful places in Korea, it seems that almost every place featured in movies, dramas, or advertisements is definitely alluring. This often causes unrest for the traveler. Approximately tourist attractions in South Korea which is worth to visit when on holiday to Korea? Well, this time we will answer your turmoil. Here we review 10 tourist attractions in South Korea that you must visit. Seongsan Sunrise Peak is a crater formed by Hydrovolcanic eruption on the shallow seabed. This eruption occurred about 5000 years ago. Seongsan Sunrise Peak has a bowl-like shape surrounded by steep cliffs around it. The cliffs that surround the Seongsan face to the sea, and when viewed from a height, this place resembles a giant green bowl. The top of this crater is overgrown with lush green grass, a scene that contrasts with the sea around it. Seongsan has also been designated as one of the UNESCO world heritage sites. The station is very crowded with tourists and photographers, especially during spring. Jinhe is a district in Changwon City, on the southeast edge of Korea. Jinhe has also been famous for a long time as the organizer of the largest cherry blossom festival annually. What makes this station interesting is that, along with the right and left sides of the train tracks are overgrown with beautiful cherry trees. As the train drove fast, these cherry blossoms would fall into place, creating a beautiful cherry petal rain. Uleung Island is also dubbed the "Mysterious Island". The island is a favorite weekend spot for Seoul citizens due to the formation of large rocks, steep coastal cliffs, and various waterfalls that form the beautiful scenery of the island. The island is made of a series of volcanic eruptions. The highest peak here is Seonginbong Peak, from here you can enjoy the scenery of villages located on the beach. 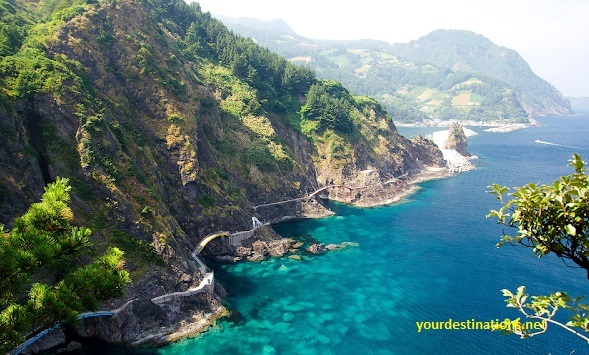 You can also enjoy the scenery by sailing around the Gwaneumdo Islands, Ulleungdo, Elephant Rock, Samseonan, and Lion Rock. Traveling to Jeju Island, you have to do a mature and wise planning. This is because Jeju offers a variety of sights that will surely tempt you. One of them is Seopjikoji, a promontory on the beach known for its romantic and serene nuances. This place is often used as the location of film shooting or Korean drama. Here, you can enjoy the view of the yellow Canola flower combined with the bright blue of the sea and sky. There is also a lighthouse that you can use to enjoy the beauty of Jeju Island from a height. Gyeongju is an ancient capital of the Shilla dynasty that has the nickname "Museum Without Walls". Bomun Pavilion itself is a small wooden gazebo that stands over a calm watering pond. Here, you can enjoy the nice scenery of the Korean spring, where the cherry blossoms start blooming over the pond and occasionally threshing the petals when the breeze blows. This place is also a perfect location for seeing Korean landscapes with various seasons. The green leaves will flourish in summer, fall Scarlett falling in the fall, and when the winter comes the trees here will be covered in beautiful snow. Udo Island can take only 15 minutes from Jeju Island by ferry boat. Located in the east of Jeju Island, Udo is an island suitable for all walks of life. Tourist attractions in South Korea are famous for its fertile land, fish, and local heritage (female divers, stone walls, and stone graves). Here are available various types of tourism that you can enjoy such as bicycle lanes, submarines, cruises, fishing grounds, and others. The highest place here is the lighthouse surrounded by a large park. From here, you can enjoy an extraordinarily beautiful island reserve. This precious island is an artifact of the Song Dynasty that is famous for its seawater, soft sandy beaches, and salt farms. Jeungdo is the largest drying salt ranch in Korea. Walk around here, you will feel a different atmosphere with other tourist sites in Korea that tend to hilly because some of the terrains here are in the form of mud. Gelodok Bridge is a bridge that will take you across the midland with beautiful scenery. In addition to the mud plains, you can enjoy the magical atmosphere of a unique salt farm. Korea has a long history as one of the best green tea producers. Tea was first introduced from China to Korea at the time of Queen Seondeok of the Silla Kingdom Haeundae Beach in the 7th century. Until now, green tea hills in Boeseong Korea are the most famous. In fact, some people say that Boseong is the capital where tea growing in Korea. Among the bedrock of tea in Boseong, the largest and most famous is Daehan Green Tea Plantation. This green tea field contributes 40% of Korean green tea commodities. You will be spoiled views of green tea plants with a formation of wriggling. Tea plants here arranged so neatly so that from a distance looks like a beautiful terrace. The best time to visit this place is mid-April. Yang Dong Traditional Village is included in UNESCO world heritage site. This traditional village reflects the typical culture and building of aristocratic confusions of the Joseon Dynasty. To preserve this cultural heritage, the Korean Cultural Heritage Administration specially established a conservation team for this village. Like aristocratic cultures, here upper-class people live on higher ground, while others live on the lower ground. The houses here have a light brown shade, with a gray tile color. There are at least 500 people still living here, even some of the houses are over 200 years old. This place is located in Gokseong and is a former railway station converted into a garden with over 1,000 kinds of beautiful roses. Although it has been converted into a park, the Railway Platform is still complete, with old trains serving as landmarks. Here are available bicycle rails that you can drive to surround the village and rose garden. In addition, there are also steam locomotives operating five times a day. This locomotive is the main attraction of the Train Village tour. This locomotive runs down the Seomjingang River. Inside the locomotive, you'll find guides dressed like waiters and ticket checks inspectors. These guides will explain you about the history of the location here. That said, this tour is the best train tour in Korea.